This is a universe, where opposites need each other in order to exist; there is no day, without night. No light without darkness. No good without evil, and of course there is no positive without there being a negative. Positivity and negativity is to be found in our thoughts and attitudes. It is not easier to be negative than positive, but it appears to be the preferred mind set for the majority. The real cost of being negative is just too high in real terms. Positivity leads to direction, a purpose and happiness. Positivity will help to maintain good health and provide you with all the energy you need to do any task that you positively choose to pursue. That positive energy leads to mankind’s greatest achievements; negativity can only lead to the worst moments in mankind’s history and it is then positive energy that moves us forward from that point. Positive energy must be constantly maintained, never let the negative in at any time. It will keep on trying, all the time to work its way into our minds, especially when we are tired, cold or hungry. 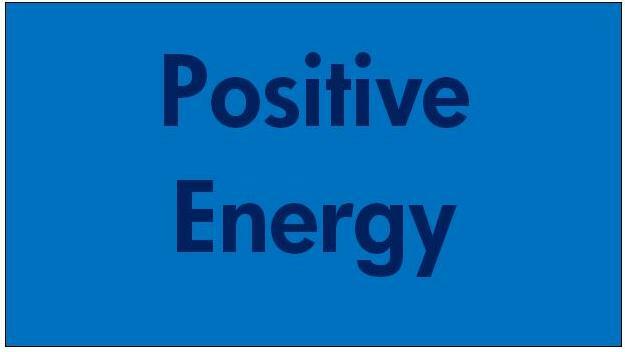 Promote and maintain your positive energy by constantly using positive affirmations, positively setting and working towards your goals and surrounding yourself with as many positive influences as you can, each and every day.